Teapot cozy is an insulated design that features an Irish blessing along with Celtic knot-work. This Irish teapot cozy features a double sided design that is enhanced with a blessing along with a Celtic motif. 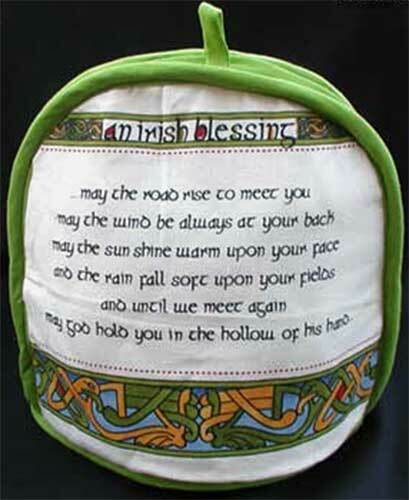 The Irish blessing tea cozy features a 100% cotton outer lining along with insulated polyester filling; it will accommodate most full size teapots. The Irish teapot cover is made in Ireland by Clara and it is complete with a Celtic knot history card, complements of The Irish Gift House.